Not enough room in your backpack for insect repellent, ointments, moisturizers, and protectants for your pooch? With LifeFORCE Nature Dog Outdoor Spray, you can have it all. One small bottle with many natural insect repelling benefits! Perfect for your outdoor adventure dog! Nature Dog Outdoor Spray is safe to use because it’s All natural and Chemical-free. The pure essential oils of catnip, patchouli, cedarwood, basil and geranium effectively protect from pesky insects and moisturize the skin & coat. The easy to apply spray bottle is just the right size for all your adventures! Tested in the Haliburton Forest! Pure essential oils of: Nepata cateria (Catnip), Pogostemon cablin (Patchouli), Juniperus virginiana (Virginia Cedarwood), Ocimum basilicum (Basil) and Petargonium graveolens (Geranium), PlantaSol CCG (Natural Vegetable Source) and distilled water. Shake well. Avoiding the face, spray dog all over and spread evenly through fur with hands. For facial application, spray in palm of hand and spread evenly over face, avoiding eye and mouth areas. WARNING: For external use only. Keep out of reach of children. Do not spray near eyes, mouth or open wounds. A proprietary blend of pure Catnip (Nepeta cataria), Geranium (Pelargonium graveolens), Lavender (Lavandula officianalis) and Citronella (Cymbopogon winterianus) essential oils. LifeFORCE Nature Dog is a Pure Essential Oil Blend that is 100% Therapeutic Quality, formulated to naturally protect your pup from outdoor pests. 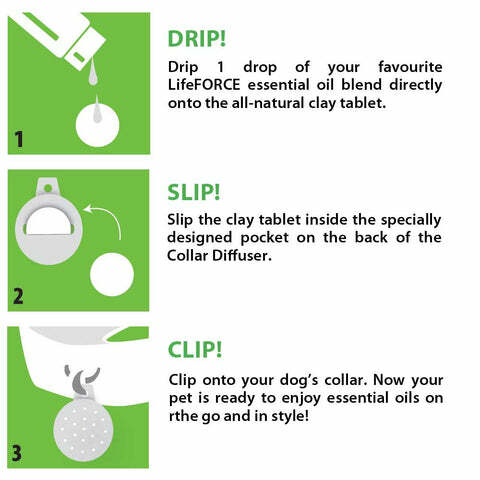 Our Nature Dog Blend should be used with our special Pet Collar Diffuser and not applied directly to your dog. Caution: Not for use with cats. Take it camping or to the cottage! The Nature Dog natural and biodegradable shampoo bar combines the aromatic properties of cedarwood and geranium with the moisturizing effects of coconut oil that will protect your pup from insects while leaving their coat soft and silky. It’s perfect for your adventurous dog… and safe for the environment! Saponified oils: Organic Cocos nucifera (Coconut) Oil, Butyrospermum (Shea) Butter, Organic Helianthus annuus (Sunflower) Oil, Olea europaea (Olive) Oil, Organic Ricinus communis (Castor) Seed Oil, Unbleached Beeswax, Dried Calendula, Cedarwood Virginia, Cedarwood Atlas, Juniper Berry, Scotch Pine, Eucalyptus, Lavender, Geranium and Peppermint.